Welcome to the official website of Author Saraiah Faith Gracie. Thank you for visiting. It is my belief that the finished product of Christian fiction should become much more than a book to read for mere entertainment or a simple pass time. Reading is indeed a favorite activity of many people for multiple reasons, but it is my vision to make fiction not only enjoyable to read, but to also allow God to use it as a tool to open the eyes of the heart in a true to life, practical way. I also wish to encourage the believer to push past the mundane and instead challenge the self-imposed limitations many of us face in our walk with God. More often than not, it is our own belief system or lack thereof that hinders us more than anything. It is my hope that as God pours out His Spirit into the lives of those who love Him, my fiction will help to illuminate the boundless possibilities resulting from a face to face encounter with the living God. 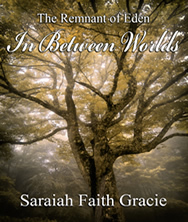 The Remnant of Eden: In Between Worlds, is the first in a series of novels that deal with spiritual warefare. Warring angels. Humanity in crossfire. The footstool of Heaven awaits. If you are a prospective publisher or agent and would like to see a full summary of In Between Worlds, click here. Faith’s premier novel, Soulfinder, is a story of love, loss and hope in the future, which is unavoidably entwined with the unfailing ability of the power of God to illuminate a life. 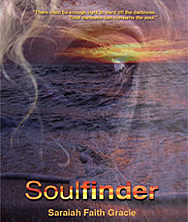 If you are a prospective publisher or agent and would like to see a full summary of Soulfinder, click here. 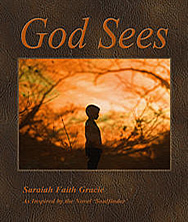 God Sees is a children’s book which is directly related to the narrative of Soulfinder. Its origin is specifically referenced in the novel and its creation is a result of this connection. God Sees will also stand on its own as an inspirational and informative story for children and adults alike.